Remember when you didn’t need a purse or wallet, when you ran everywhere, laughed at everything, and only worried about making it to dinner on time? Remember when taking on a dare gave you courage and you spent more time on friendships because you had more time? When songs and stories take us back in time with an eye toward recalling important lessons, I believe we can find the wisdom and confidence we need to face the fears of growing up, taking risks, and growing old. Some challenges are more personal…. like getting her email address. 1) We are only as good as the company we keep. 2) A forever friend is a friend made, and kept, without pretense. 3) Jealousy springs from a limited sense of blessings and a belief there is not enough good to go around. 4) We all have been blessed with hidden talents and our task in life is to find them. 5) Growth happens when we challenge ourselves. If we only put ourselves in safe situations, we do not grow. 6) It is important to continually challenge ourselves and to find something of value from every mistake. Number 6 is the reason I get up in the morning and do what I do. So, what are you doing today to challenge yourself? 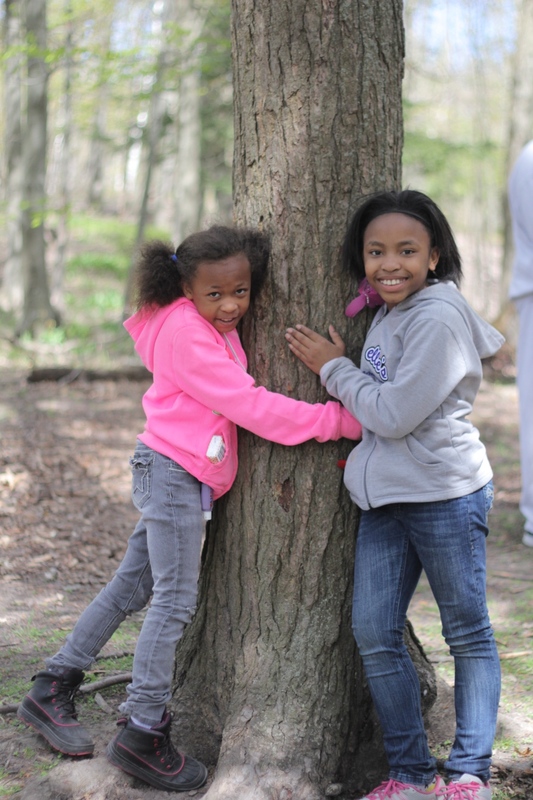 Why is it important for our kids to form a connection to nature? Because nature connects us to our humanity. As humans, we are spiritual beings, whether we acknowledge it or not. The essence of what makes us human, our self-awareness, and our ability to choose, these are spiritual gifts. Some people float along without purpose, never fully knowing what they are capable of through these gifts. 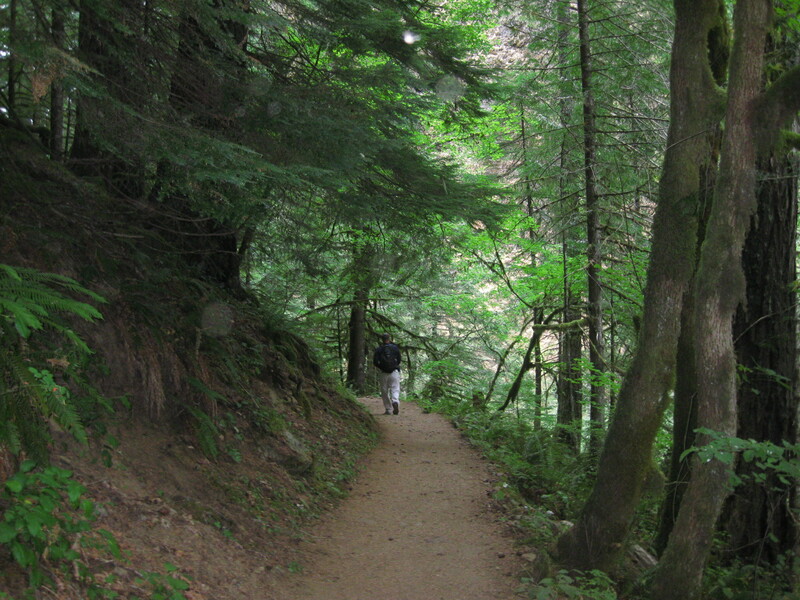 Being in nature allows our spiritual identity to emerge. It doesn’t take much to be in awe, in nature, a sunset, a thunderstorm. And when we are still, and in awe, we discover our inner self, we have that epiphany, that revelation, and from that, we derive a purpose. Sleep-over summer camp is a very effective alternative environment that jump-starts maturity levels and helps kids to find, and be, their true selves by helping them find their inner strengths. 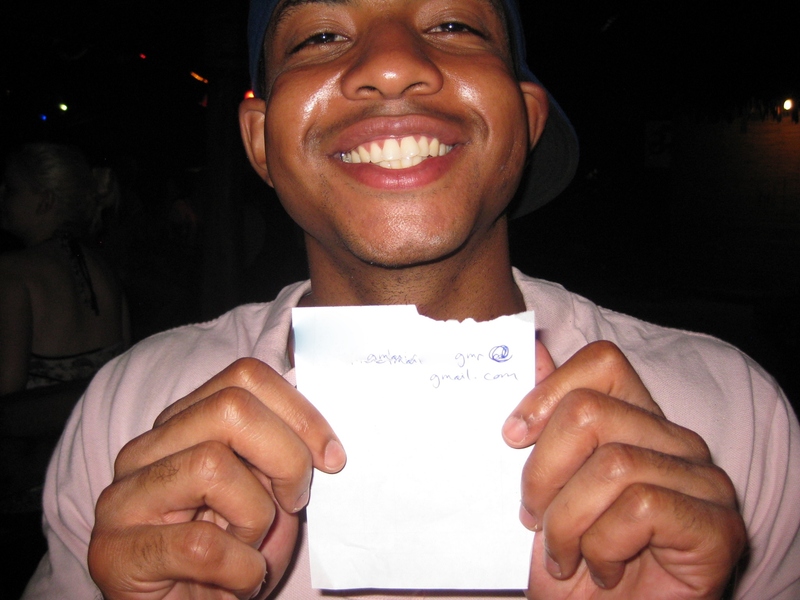 It also helps them find friends who will celebrate their strengths and help them overcome their weaknesses. 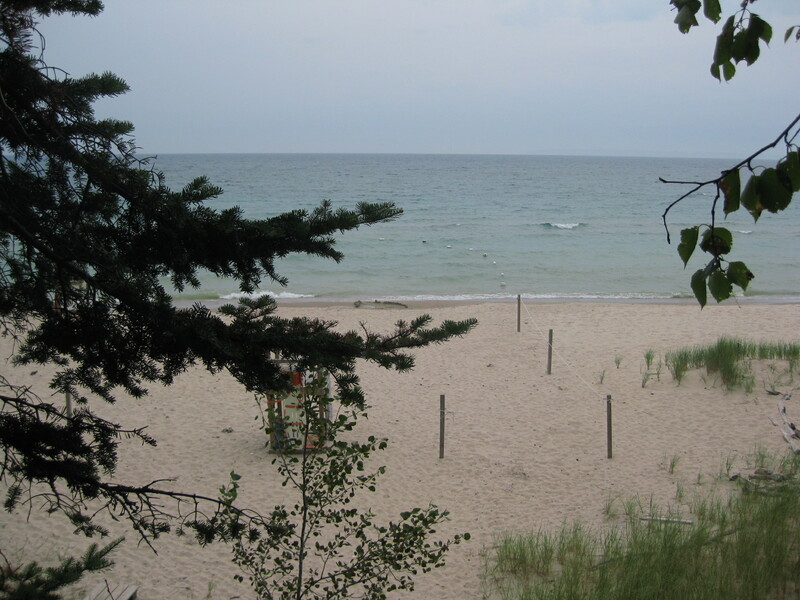 I used to attend camp on Lake Michigan, near Sleeping Bear Dunes, for seven weeks at a time over five summers in the Nineteen-Seventies, as a teenager. Memory Lake is that trans formative journey and it shows how sleepover summer camp, and nature, can change even the most troublesome teenager into a confident, grateful, and inspired adult. This is not the National Lampoon version of summer camp, where boys and girls just want to sneak out, or mean girls play mean pranks , or everyone just wants to win some crazy competition. 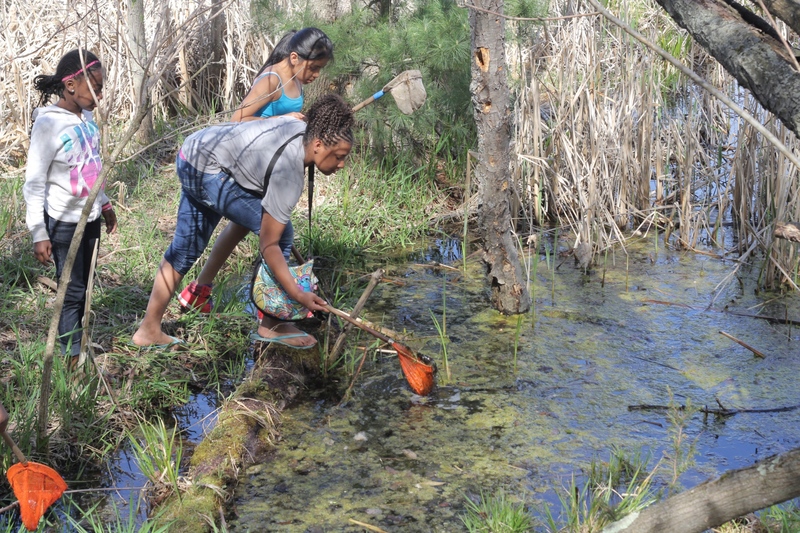 This is summer camp as it was intended to be; education over the summer that immerses kids in nature and gives them real challenges with a system in place to develop integrity and courage, and a spiritual connection. I’m already saving up so KT, (my daughter) can send Lilly (my granddaughter) some day! KT, camp alumni, and Lilly, future camper! 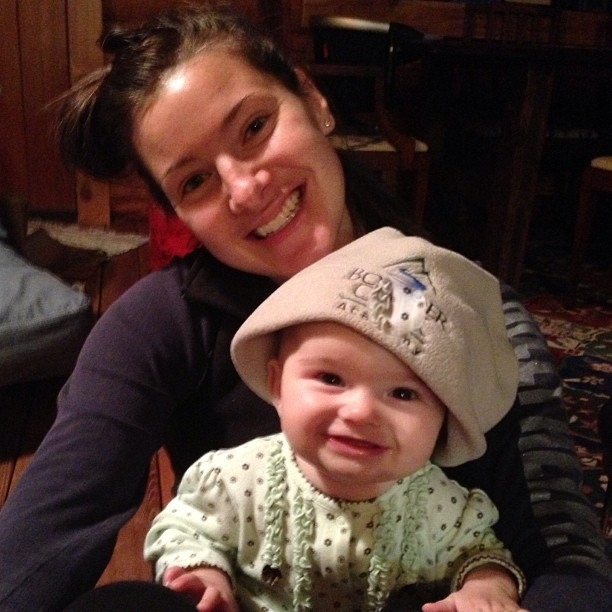 My final post for 2013 is from Jen Murphy, MEd, Development Director of the Leelanau Outdoor Center (LOC) in Maple City, Michigan. “Three years ago, I was living in a warm climate working with at-risk youth and their families and felt that I wasn’t making much of a difference. Too much red tape. Too much to change. And not enough support. I needed a different direction. I headed north. What I didn’t know when I left a home and career behind for this new adventure, was where I would end up. 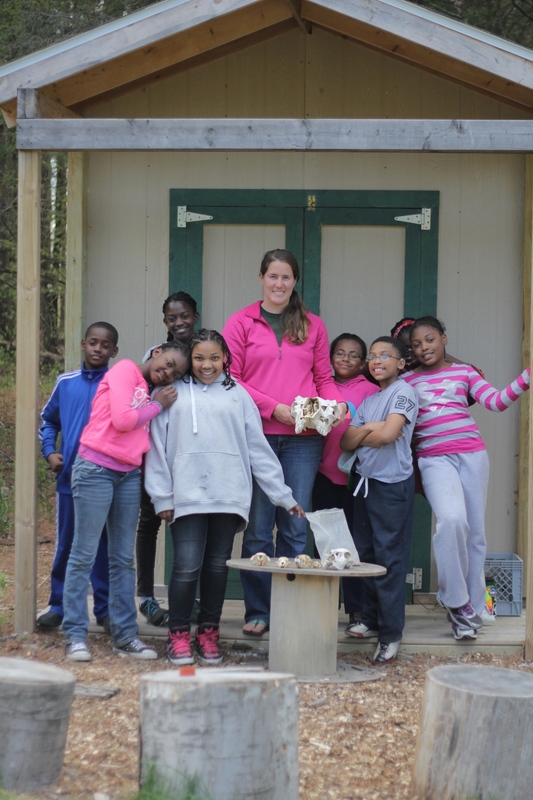 I started writing grants for the Leelanau Outdoor Center (LOC), a non-profit outdoor education center that serves over 2500 students each year and focuses on both character education and stewardship of the outdoors. 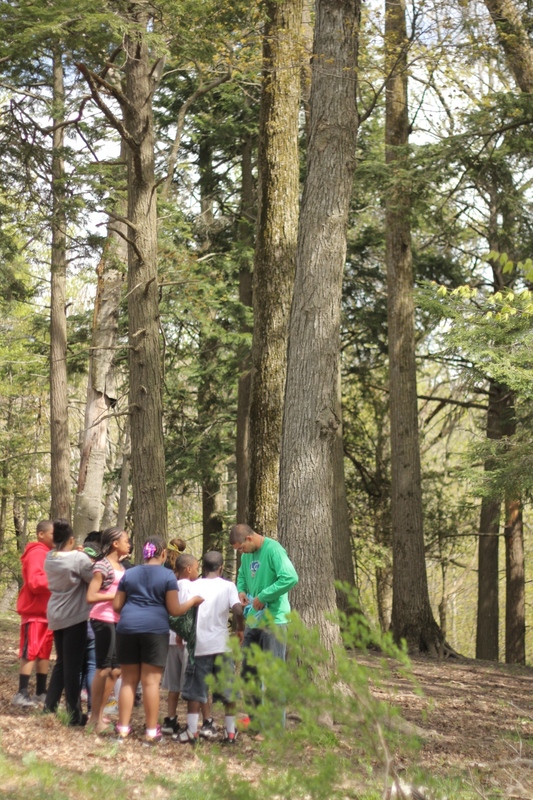 What’s amazing is that outdoor education is one of those things that often gets a “back seat” to everything else going on in the classroom. Schools today are expected to do a lot: improve student test scores, increase graduation rates, individualize instruction and provide character education at the same time. Due to the demands placed on teachers and administrators to meet student performance standards, character education takes a back seat. This missing component often leads to classrooms with students who resort to fighting with peers and arguing with teachers because they don’t know how to get along with others and solve interpersonal problems effectively. Just like the kids I had worked with for years. Programs at the Leelanau Outdoor Center (LOC) are designed to fill in this missing piece. A typical program includes full accommodations and meals for 3-4 days. Students are immersed in a safe and open atmosphere that is removed from the pressures of school and home life, so they are free to focus on the lessons of leadership, communication, and self-confidence. 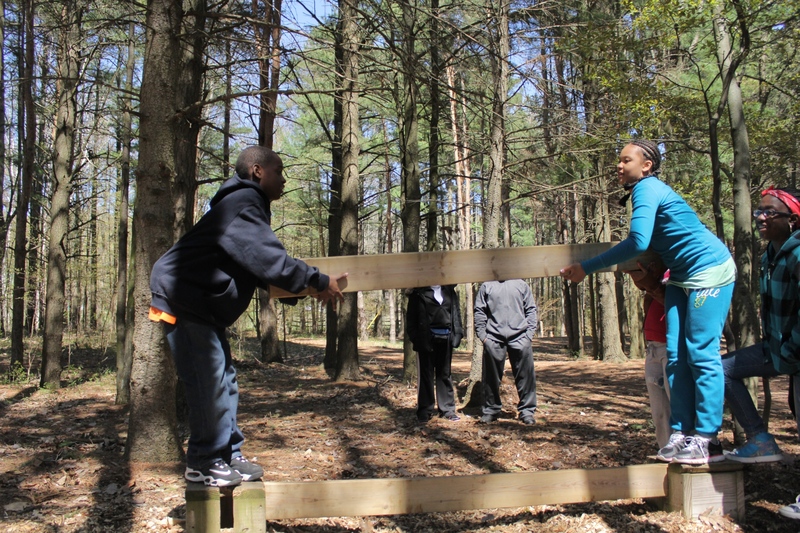 LOC also includes a variety of fun seasonal activities, such as hiking in the Sleeping Bear Dunes, aquatic studies, animal tracking, snowshoeing, cross-country skiing, canoeing, team building exercises, and navigating a high ropes course. What student wouldn’t benefit from that! In fact, nine out of ten students attending LOC attributes their time here for growth in confidence, leadership, and their ability to communicate with others. 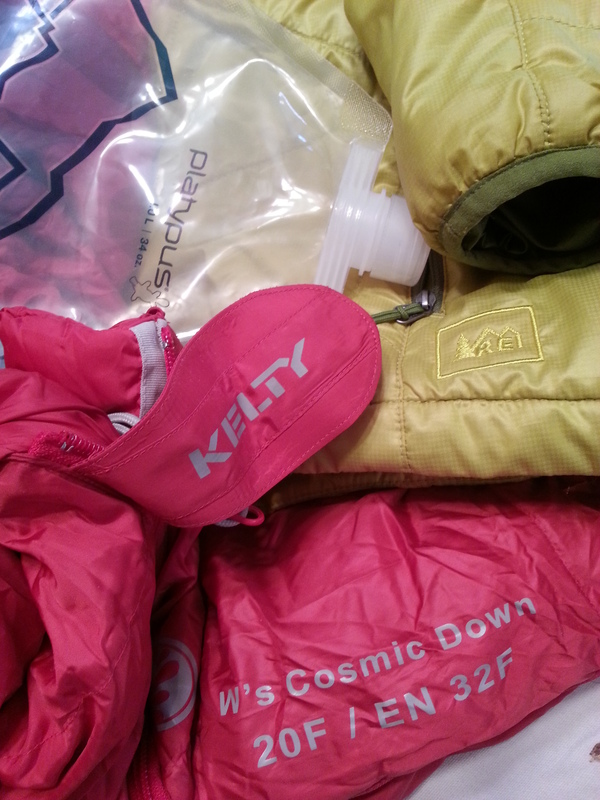 My Gear; sleeping bag, down coat, and water bottle. I haven’t slept in a cabin in almost four decades since my last year at camp. 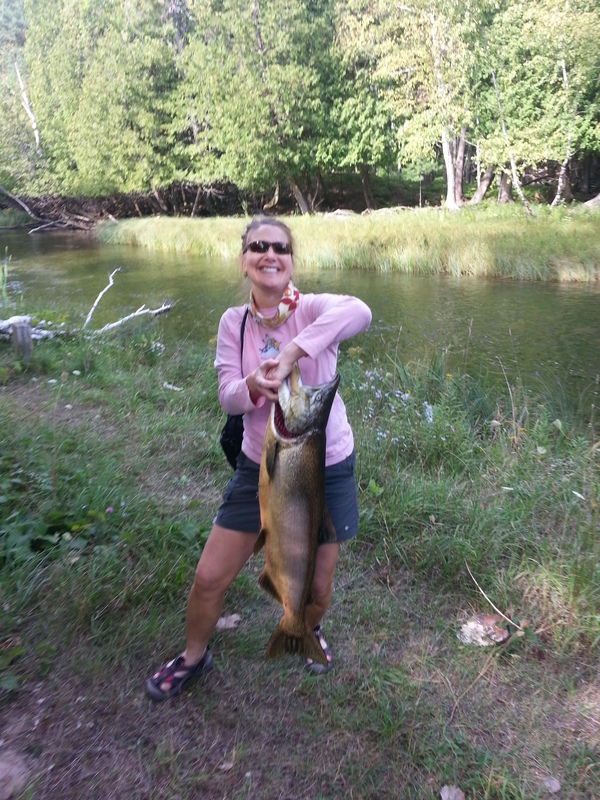 The prospect of doing so in late September in Northern Michigan did not appeal to me. But that’s how this camp reunion was shaping up and I had already booked my non-refundable flight. I felt confident of a good time, even if none of my camp friends had signed up, because I traveled with ‘Lathe’. We call her ‘Lathe’ because otherwise she’d be another Susan. She coordinated our flights from Northern Virginia and made sure I shared her cabin. Lathe is a board member, (one of those mysterious ladies behind the scenes), and we had attended camp together all those years ago. Lathe looked up to me, perhaps, (probably not), because I had been a Counselor in Training when she’d been a camper. Since she decided to sleep in an unheated cabin, and I look up to her now, I decided I should sleep in one too. And, I wanted to prove to my husband that I could rough it, (never mind the actual bed and cabin), and I wanted to prove to myself that I really had learned all those great life-changing lessons in Memory Lake. I bought a sub-zero sleeping bag from REI and a high-tech down coat and packed flannels and wool socks. 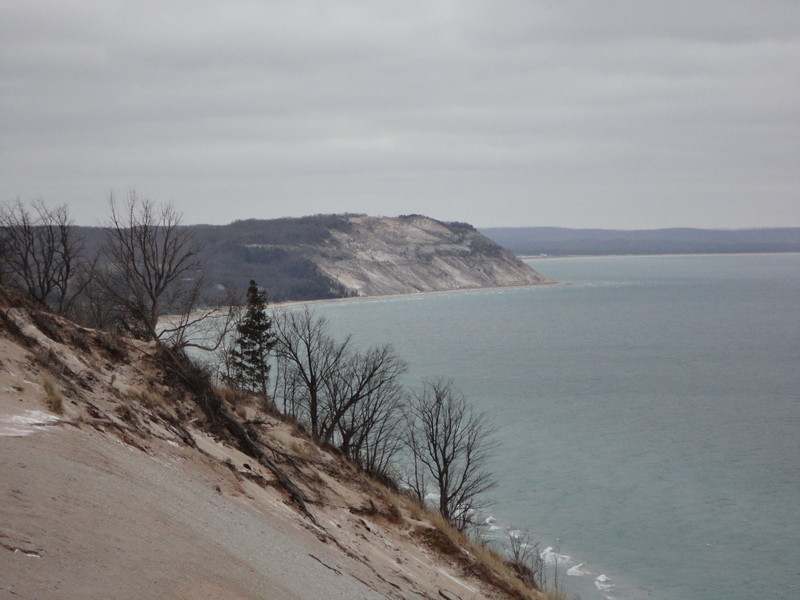 The first night, Lake Michigan raged below the cliff and a cold wind whipped through gaps along the shuttered screens. My nose dripped through the tiny gap of my zipper’s opening. I tried to fall asleep but mostly I held stiff and rigid on the plastic mattress covered in a towel. I imagined snow drifted against the back of the cabin. “Do I have to go to the bathroom?” I wondered, taking a body check in the dark. “No, I can wait.” Time passed slowly and painfully. “No, I can’t wait,” I decided. I unzipped the sleeping bag from toes to shoulders. Its high-pitched rip roared like an alarm clock. No one stirred from the rows of bunks, but I imagined having awakened them all. 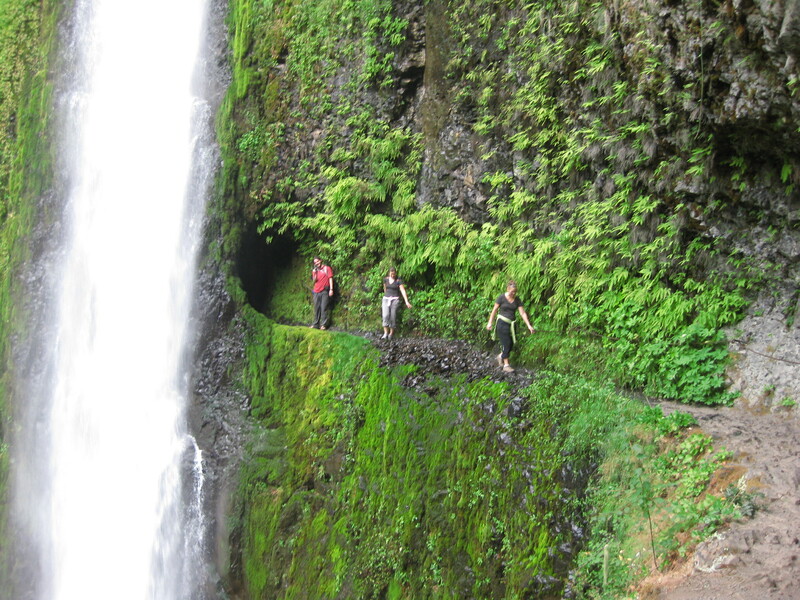 I donned my down jacket, which I had been using as a pillow, slipped into my Keens, and tried to tip-toe down the aisle toward the door in complete darkness. I unlatched the metal hook, (more unbearable noise,) and braced for an arctic blast. A balmy breeze hit me. As I darted for the bug light outside the bath house, I wondered, greatly annoyed, why it seemed so darn cold in the cabin! I repeated this same noisy routine two more times before dawn. Far too early, someone hit the cabin light. “Dips,” a voice whispered. My bed had finally become warm, cozy, and comfortable and I did not want to move. When I emerged from my mummy bag, all the beds were lifeless except the one nearest the door. Ellie stood beside her foot-high pile of blankets hauled to camp in her car. She raised her eyebrows at me and the unsavory task ahead; getting into swim gear. She rushed, so I rushed, because we couldn’t miss dips. Lathe was out there. Everyone was out there. I wanted to ask her how many times she got up, if she had heard me, and if she had slept at all. There’s a Big Fish story here. Would you believe it jumped into our canoe? During the reunion, I stuck near Ellie and she proved my theory; every perfect camper needs an imperfect friend to balance out the universe. We were those imperfect campers. Ellie and I had amazingly similar memories. We dreaded council fires for not earning ‘beads’, though we happily watched our friends win awards. We always messed up in front of counselors or just missed that opportunity to be helpful. Our similar stories made us laugh from pure joy and gratefulness because we knew even as mediocre campers, we had developed confidence, leadership abilities, and hidden strengths by attending camp. Suzy, (another imperfect camper), suggested we had actually reached perfect camper status because we attended camp reunions. She offered this bit of wisdom as she navigated our canoe down the Crystal River. (Her mom had wisely put a ‘z’ in her name to differentiate her from all the other Susans, and it worked once you knew the ‘z’ was there.) Suzy had been a camper in the Fifties. She so effectively linked our camp experiences, I now feel connected to the old camp. Suzy is how I imagine my mom would have been as a camper, and how she would be now, if she had lived. Marcia (aka ‘Robyn’ in Memory Lake) ran the reunion and tried to keep us on some sort of schedule. (Josh, our talented chef, really appreciated that.) Honestly, Marcia’s dedication amazes me and I’m still trying to live up to her expectations. “Since you’re the writer…,” she told me 15 minutes before ‘skits’ on the first night, “Write some dialogue for us. Here’s the scenario….” I spent ten minutes locating paper and pen. Frantically, I managed to eek something together and it actually drew laughter. Phew! I suppose such feats are possible at camp because expectations run high yet everyone is easy to please. The rainy day turned out to be my favorite. We sipped hot tea and hung out in the heated arts and crafts shed amid a cozy atmosphere of creativity. Lathe, Kappy, Deb, Murph, some Susans, Diane, and Lee Ann wove complicated, intricate bracelets to rival boutique merchandise. 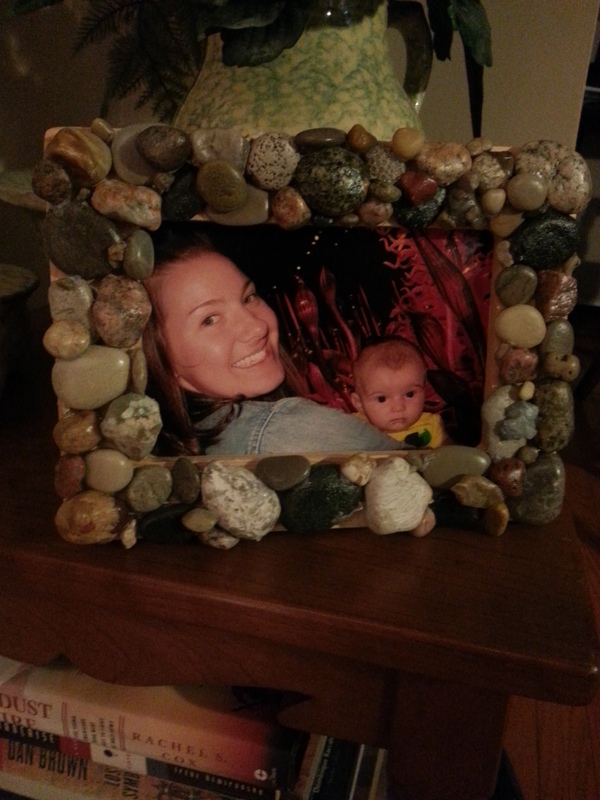 Ellie and I hot-glued rocks to wooden picture frames. We didn’t even gather the rocks ourselves, I’m embarrassed to say. Except, I did add a few tiny pebbles as fillers, purposely gathered on my exciting day of canoeing the Crystal River with Suzy. Except for a deep longing to return to my heated bedroom in Virginia, I was sad to leave the company of so many confident, accomplished women who similarly credit camp for defining their strengths and honing their focus. We are fit, optimistic, and not nearly finished with all we intend to accomplish. Thanks ladies, you have reminded me why I wrote Memory Lake. 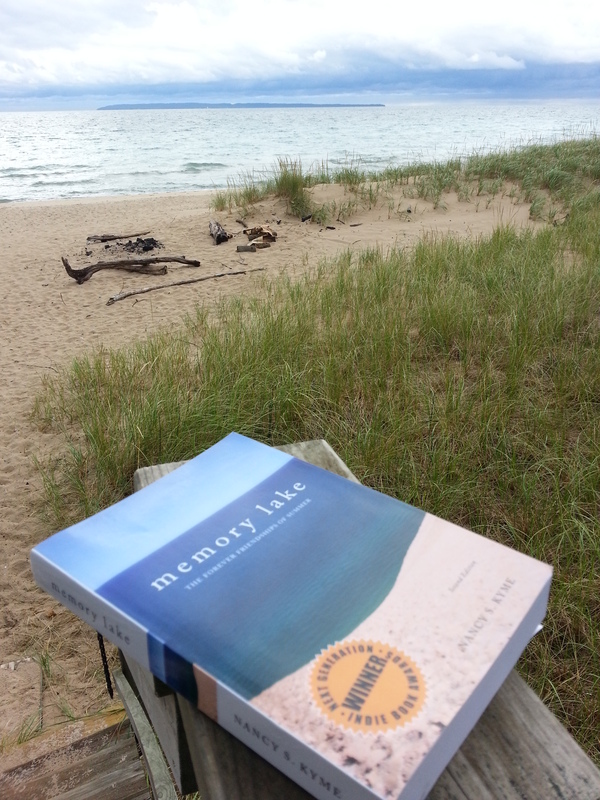 (Now in its Second Edition with an authentic cover depicting Lake Michigan from the top of the Sleeping Bear Dunes!) 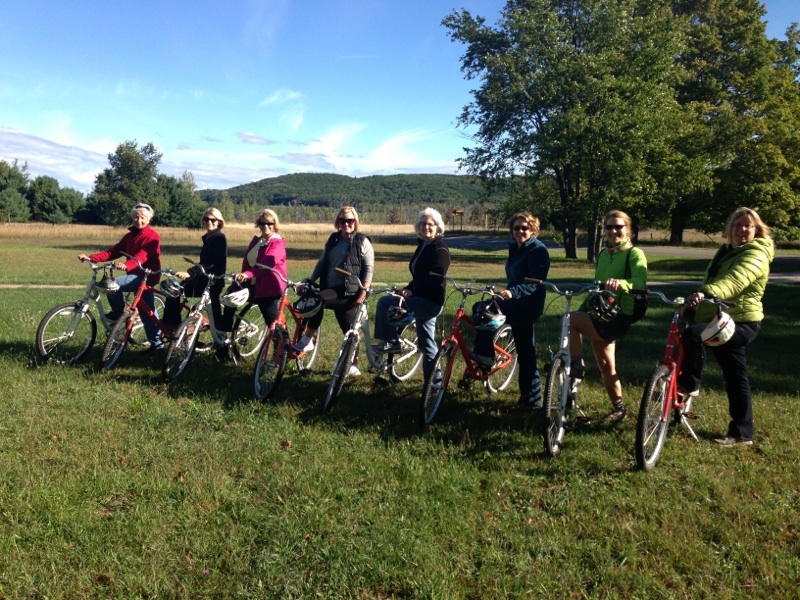 Many thanks to the year-round staff of the Leelanau Outdoor Center (LOC) for making the week-end possible. Inscribe your favorite books, underline passages, and hold on to them. They will tell your children, and their children, more about you than any photo album. Thank goodness my mother never met a book too intimidating to write in, to bend a corner, to underline a passage, or scribble a thought. 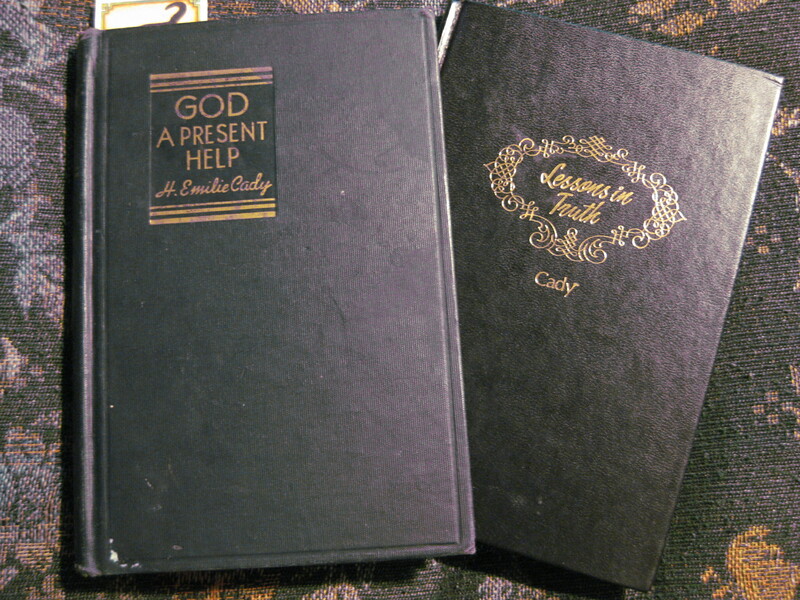 A First Generation book from the 1940s beside a Second Generation book from 1986. Both are user-friendly. 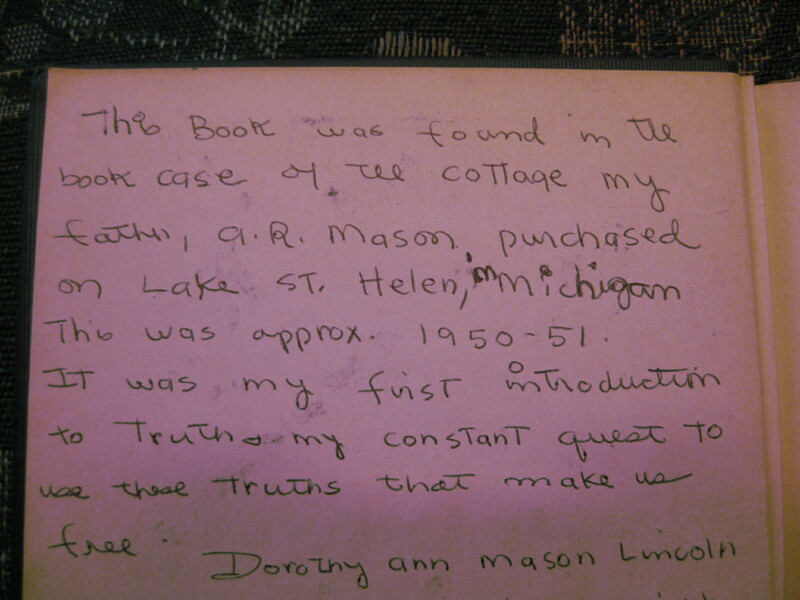 When she passed away in 2001, at 64, my step-dad boxed up her metaphysical book collection and sent it to my sister. Overwhelmed by memories, Susan sent the box to me. I hastily absorbed it into my collection of similar books Mom had given me over my adult life. Each one is packed full of wisdom. Every book is inscribed and many contain Mom’s left-handed scrawl of a random thought as she worked out its meaning. Mom had been raised Catholic. I often asked her why we were not Catholic, same as Nanny, Papa, my aunt, uncle and all our cousins. She confided a longing for something different at an early age due to a little book she had read as a teenager. She never mentioned the name of this book or where she had found it, only that it had changed her life. The little black book with a history, and its compatible hardware. 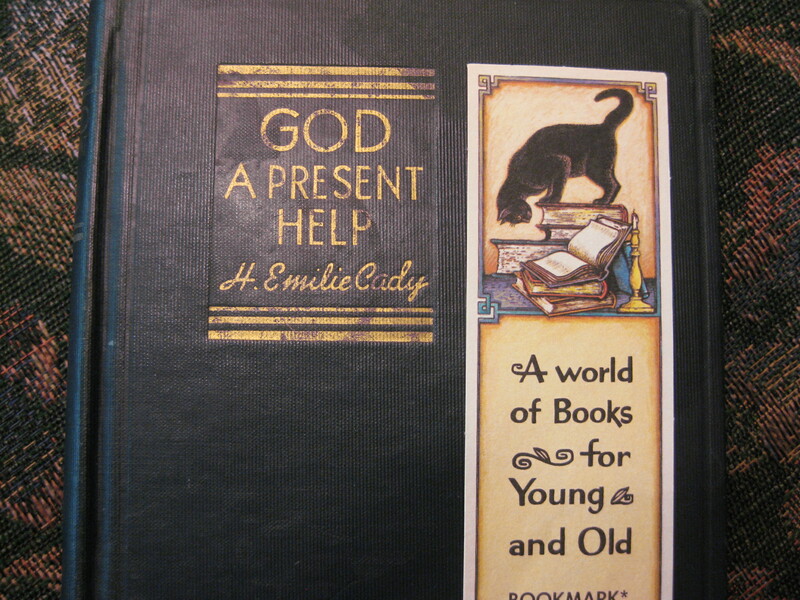 The little black book’s inscription. Her father’s cottage is mentioned in Memory Lake as ‘Papa’s cottage’. This log summerhome on tiny Lake St. Helen, in Central Michigan, delivered a childhood of laughter, pranks, skits, and sunshine to my sister, my cousins, and me. I still dream of its artesian well, woven hammocks, rocky flower beds hiding fat night-crawlers, and the steep hill to the lake. Its musty interior held many more treasures; a deer mount, faded upholstered furniture, bookshelves of hard-bound classics, and a defunct player-piano. When I was ten, Papa sold all of it upon learning he was terminally ill. 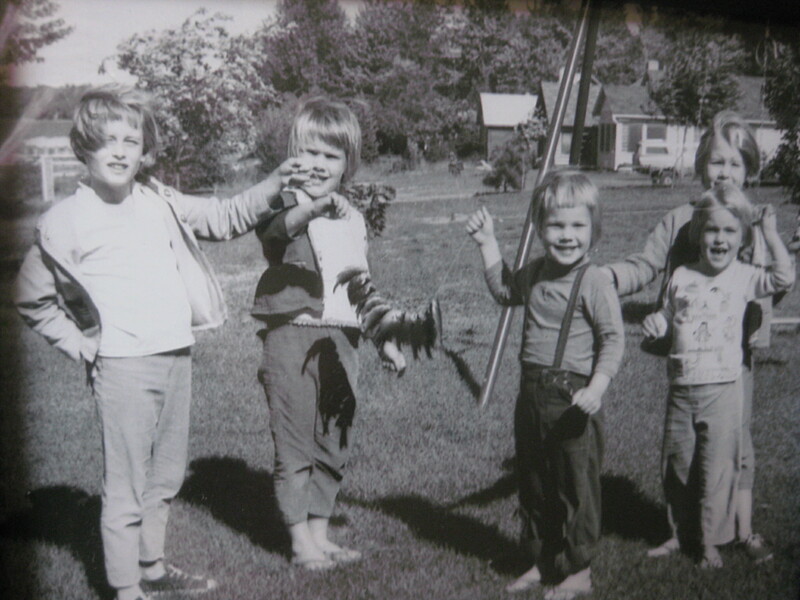 Soon after, my sister and I began our years at summer camp. Fish caught from the night-crawlers dug from Papa’s flowerbeds. That’s me in the middle. My mother was fourteen when her father bought the cottage fully furnished. She hadn’t liked the place at first. Bored and disgruntled to be spending the weekend at the lake, instead of at home with friends, I imagine she had knelt on the large woolen rug, wearing saddle shoes and bobby socks, to examine the bookshelf. There she had found this little book and began reading. Memory Lake is a ripple of this memory which continues to expand sixty-two years later. The little black book is inspiring, but not surprising because Mom had succeeded in her quest for truth and raised me on it. Instead, the surprise lies in the book’s existence. It held the capacity to sleep for decades without updates, conversions, or electricity to reveal a profound window to the past. I wonder, will someone find an e-reader sixty years from now with such a personal impact? Most likely it will not power up. Inscribe your favorite books, underline passages, and hold on to them. They will tell your children, and their children, more about you than any photo album. * H. Emilie Cady is the little black book’s author and she is affiliated with Unity. This is not the church I attended, nor the church affiliated with the camp in Memory Lake, so it is a fun coincidence that she was from Dryden, New York, the same one stop-light hometown of my first friend at camp, and main character in Memory Lake, “Nancy Roman”. The wind breathes a song of ancient wisdom – only listen to the rattle of the ghost forest up on the dunes. It’s the story of Dapine, mother bear, proud parent of sharp claws and soft fur. Her cubs dancing on rolling Wisconsin plains, two brothers in the summer sun, animated by a boundless spirit. A bond unbreakable, unbelievable, takes us back to that terrible month when the sun hung too close to the Earth for too long. Day after day, the leaves curled and the grass progressively turned orange. The forest was brittle and dangerous. Then one night lightning struck and set a dry patch ablaze. As luck would have it a fierce wind howled and blew the flames higher and farther, until the flames towered over the forest animals. Instinctively, Dapine ran for Lake Michigan, that immortal body, her cubs racing behind her, tripping over their young, clumsy paws. Though safe in the calm, placid waters of the lake, she saw in the thick black smoke the desolation and starvation that awaited her cubs once the fire died. Where they’d rolled and played and sweet honeycombs had bounded, charred nothingness would smolder. So Dapine swam, desperate, one stroke at a time, towards Michigan. The journey was long and difficult, and the young cubs struggled to keep up, panting, tongues agog. On the second night of their journey, a great storm whipped the lake into a panicked frenzy. Hail pelted their thick coats; lightning made their fur stand on end. And somewhere in the wild waves she lost her cubs, their panicked faces illuminated by one last flash of light before being enveloped in permanent darkness. Dapine swam against the tide for many hours in search of her cubs. She cried out their names, desperate, painful screams full of sorrow. But no answer. Exhausted, she turned back the following morning for the northwest shore of Michigan. Drenched and tired, she finally pawed her way onto the promised beach. At last. The sky was deep and blue, the green expanse of trees swayed in the wind. There was food, shelter, and water. All Dapine could think of was her cubs. She felt little relief or happiness in having made it alive to Michigan. Day and night, she faithfully watched the endless waves hoping to catch a glimpse of her lost cubs. In her many, fevered dreams, there they were, safe and warm in the old den, gnawing on the fish bones held between their tiny claws. 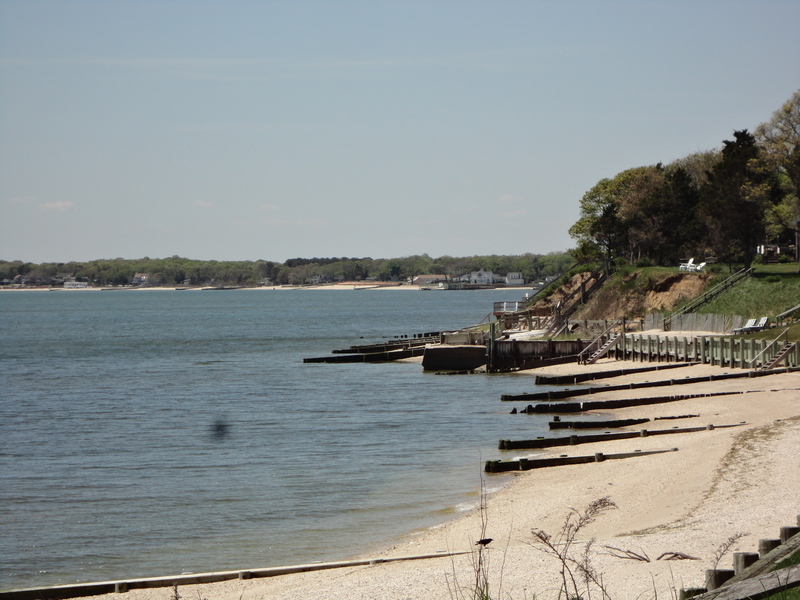 She quickly grew wane and emaciated, her hair falling out in tufts on the soft sand. Seeing Dapine, the Great Spirit was moved to tears by her story, from the veil of impartial observation to utmost mercy. 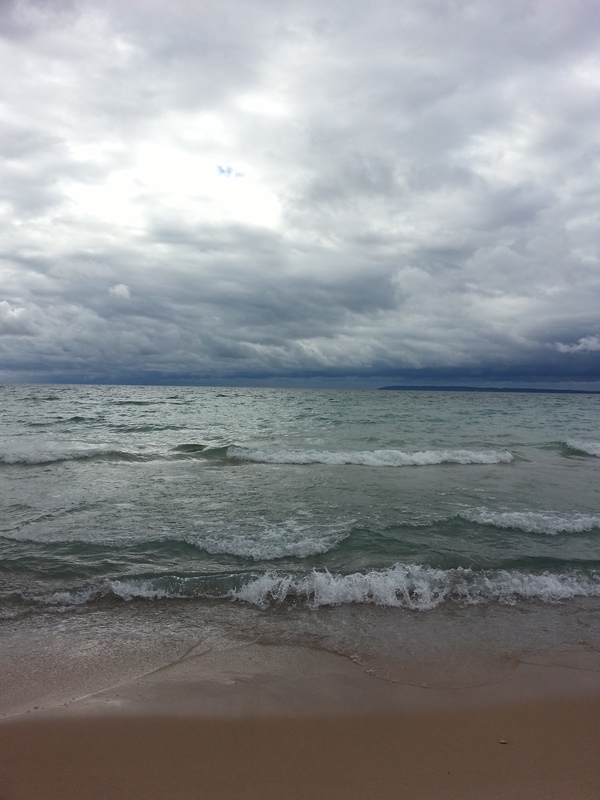 As the earth shook and a hard rain fell, he raised two large landmasses above the waters of Lake Michigan in remembrance of Dapine’s cubs, North Manitou Island and South Manitou Island. 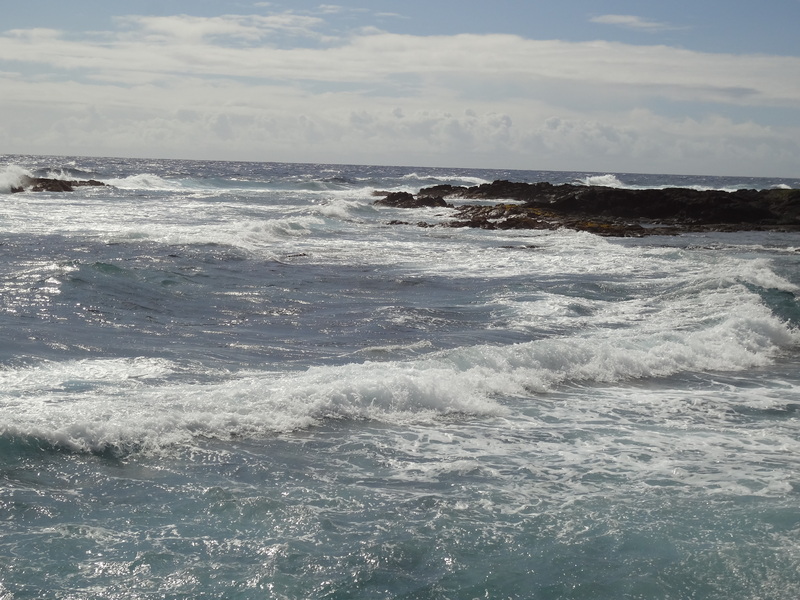 He imbued the islands with their innocent energy, so that it would be a grand memorial to Dapine’s loss. She saw this, and like animals always do, knew right away what it meant. And so with heavy sigh, Dapine closed her eyes and slept by the waves. It was then she felt a sudden lightness, her soul hovering over her own body. Carried by the force of the Great Spirit, she ascended up beyond the worries of the world, where in the limitless sky her cubs hopped from cloud to cloud in excitement, reunited with their mother at last. Back down on earth, Dapine’s body turned to sand, more and more sand. 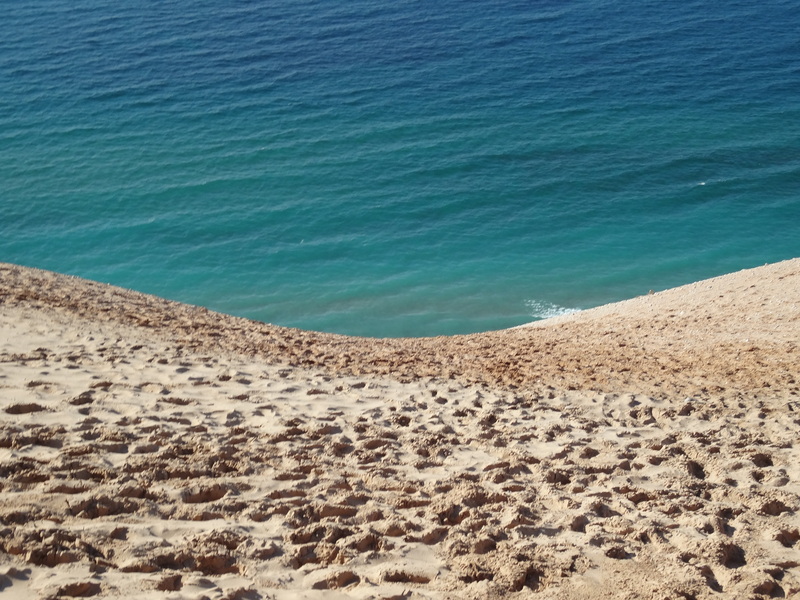 In her place a great dune emerged, which from the Manitou Islands resembled a giant sleeping bear. The Great Spirit did this as a testament to the power of love, the story of Dapine and her cubs. 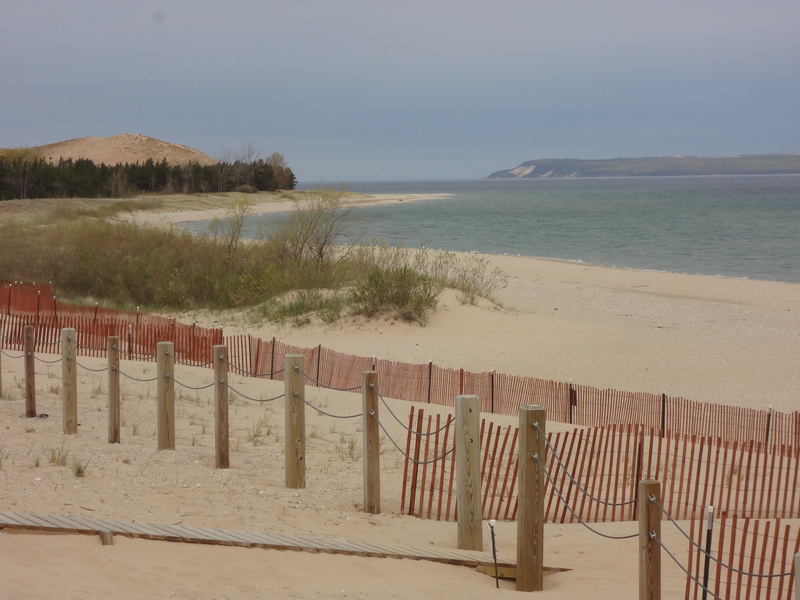 Even today, the area is called the Sleeping Bear Dunes, and the story is written of on plaques and in books, never forgotten.